Note: Does Not Work On Small Posts. This tutorial will help you in adding Floating Social share buttons under every post of your blogger blog. I personally use this widget in my blog. The widget is light in size and looks elegant. In every post after scrolling the widget will pop up at the lower bottom of the screen. The widget contains four social sharing buttons - Facebook, Twitter, Google+, LinkedIn. There is a close button too to close down the floating share buttons. A live demo can be seen on my blog itself. Just scroll down to the comments section and this floating social share buttons bar will appear. You can also close it by clicking the close button. Once you have seen the demo to add this widget in your blog just follow the below steps. First go to Blog Title → Template → Edit HTML. Press Ctrl + F and search for <data:post.body/> code and paste the below given code just below <data:post.body/>. NOTE : There maybe more than one <data:post.body/> so make sure that you have selected the right code. Add the code and follow the next step. To add this widget you have to go to Blog Title → Template → Edit HTML and add the below given code just above </body>. The code has been optimized and made lite so it loads faster. After adding the code change change AllBloggerTricks with your Facebook Page's ID. Finally save the template. You are done now. 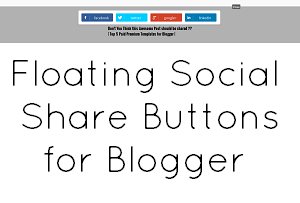 Now you and your visitors can see this awesome Floating Social Share Buttons in your blogger blog. why this will not work on alll templates ?? Thanks A Lot for sharing this post! @ALL POST UPDATED PLEASE CHECK IT OUT AGAIN. Keep up the good work. This is not working. Can you please take a look. What do you mean by "Not working on small posts"? This is nice and working good, how to add this widget below post title? look good in myblog, thanks man.. Which Template do u use bro? how its working on your website, how I can fix this? It's working in my blog.. Thanks for sharing this code.. Thanks for sharing this awesome code! Nice Social buttons shared. but can we reduce the size of icons. allthough its a nice and a very useful article. hi..It is not working on my blog. Pls help.